We’re Georgian Door & Gate, a company you can expect quality work every time. We are a garage door company for many years now, and our technicians and installers will always exceed your highest expectations. Call 705-733-1211 today to discuss your garage door and opener needs. Issues with your garage door? You can count on Georgian Door & Gate if you have issues with your garage door, to be there for you when you need them. Just call 705-733-1211, or fill out our online service form. We’re here for you in Barrie, Innisfil, Alliston, Bradford, Newmarket, Wasaga Beach, Elmvale, Midland, Penetang, Orillia & Muskoka cottage country. With nearly 3,000 people, Midhurst is the largest population centre in Springwater. 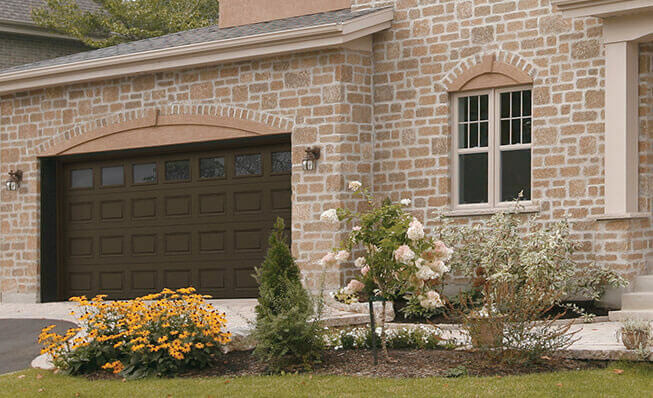 Take a look at our image gallery to find the perfect garage door that best suits your Traditional home and your neighborhood. We also have a door for any architectural styles, as carriage and contemporary. Call us today! Garage door parts in Midhurst, ON? If you just want to update the look of your door, we have many accessories. Nothing lasts forever, if something is broken on your garage door, give us a call at Georgian Door & Gate. We can replace panels, springs, openers or anything else you might need. Looking for the best door openers in Midhurst, ON? If you’re looking for a garage door opener, we have what you need. We recommend LiftMaster products for every need whether it is for your commercial or industrial site, but also for your home. Not sure of your garage door’s choice? Midhurst gets all kinds of weather: snow days with cold temperature in winter, and humid heat in summer. At Georgian Door & Gate, we recommend GARAGA insulated doors to keep you cozy all year. Both North Hatley and Eastman models are rated R‑16 for energy efficiency. Take a look at our Design Centre where you can experiment with different looks.